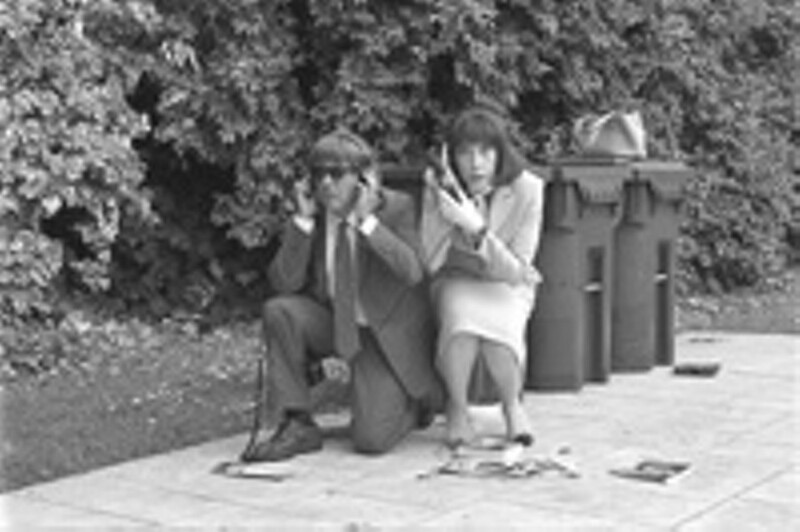 Twentieth Century Fox At least theyre funny, sometimes: Dustin Hoffman and Lily Tomlin in Huckabees. The makers of the new movie I Heart Huckabees describe their work as "an existential comedy." Apparently, that translates as a film that pretends to examine something like the meaning of life and the structure of the universe, with laughs thrown in. The picture, which features a well known and mostly distinguished cast, occasionally provides some moments of humor, and its characters frequently discuss some questions of existence and reality. That combination presumably fulfills the promise of the subtitle, though the depth and importance of the action and dialogue remain open to question. The protagonist, Albert Markovski (Jason Schwartzman) heads a group of environmental activists intent on saving some unspoiled areas from the encroachments of suburban sprawl. The chief enemy of his organization, Huckabees, some sort of megastore, plans to develop yet another shopping mall, which will of course despoil the usual meadow/marshland/forest. Markovski and his cohorts organize demonstrations --- his protests generally take the form of reading his own bad poetry --- against the project, which furnishes the excuse for a more or less generalized conflict in the film. The real plot, if that term truly applies, involves Markovski's personal dilemmas, his perfectly understandable feelings of failure and inconsequentiality, and his puzzlement about certain events in his life. To solve the question of a recurring coincidence in various contexts of his daily activities, he consults a firm of private detectives, a husband-wife team, Bernard and Vivian (Dustin Hoffman and Lily Tomlin), who call themselves existential detectives. The detectives lecture their confused client about the interrelationship of all events and objects in the universe and promise to solve his problems in understanding those connections. To flesh out the general silliness, the script brings in an assortment of other people, most of them oddballs and eccentrics like Markovski, Bernard, and Vivian. Jude Law, for example, plays Brad Stand, a high-ranking employee of Huckabees, who works as a sort of double agent with Schwartzman's environmental coalition, undermining the efforts at preservation while furthering the construction plan. Brad also participates in a remarkably silly romantic subplot involving the Huckabees Girl, a model named Dawn Campbell (Naomi Watts). Perhaps reflecting the existential detectives' belief in connections, Mark Wahlberg plays a dreamy fireman who shares some of the environmentalists' concerns. Believing that petroleum is the source of all evil, he renounces the internal combustion engine and refuses to ride on the truck, choosing instead to bicycle to fires. He also provides both a dramatic and an existential connection, ending up with Naomi Watts and introducing Markovski to the work of a French anti-existentialist philosopher, Caterine, played by Isabelle Huppert. Most of the actual plot of the film consists of quantities of silly nonsense accompanied by a good deal of sheer blather. Hoffman and Tomlin shadow Schwartzman and a few other people, popping up at a number of inopportune moments, snapping embarrassing pictures, and intermittently continuing their discussions of existentialism. Law and Watts bicker meaninglessly, and the French philosopher stalks the confused poet-environmentalist, attempting to negate the ideas of the detectives with her own brand of nihilism, preaching, "cruelty, manipulation, and meaninglessness." Despite the filmmakers' apparent intention to make something like an absurdist comedy of ideas, occasionally displaying a passing familiarity with some academic texts and philosophical positions, the picture constantly strays into mere pretentiousness. Its comedy, on the other hand, rapidly grows ever more laborious, betraying an agonized and almost entirely unsuccessful effort to be funny. The constant introduction of new characters and additional discussions of beliefs and values suggests a desperate attempt to flesh out a thin and ludicrous premise. The cast quite accurately reflects the failure of the picture's conception, mostly overacting directly at the camera or delivering long swatches of dialogue in the manner of a memorized speech. The alleged star, Jason Schwartzman, continues to demonstrate a spectacular lack of appeal, and his scenes with Mark Wahlberg achieve a rare level of embarrassment in style and content. Both Hoffman and Tomlin --- what are they doing here anyway? --- at least seem funny now and then. They speak their lines with the sort of conviction and seriousness that comedy requires. Aside from a moment or two of actual humor, and some valid citations of real texts and sources, I Heart Huckabees looks like a self-indulgent exercise for the writer-director, David O. Russell. How he managed to obtain backing for the picture and the presence of some big, expensive names may constitute a more intellectually challenging question than an exploration of existential comedy. Huckabees, however, must be the first (and probably the last) movie to cite Hermes Trismegistus, a figure from antiquity who probably wouldn't have enjoyed the notion of Dustin Hoffman taking his name in vain.